Hurdy Gurdy is available at a special discount price as part of our Hurdy Gurdy / Crank bundle. See our Hot Deals page to grab this offer. The hurdy-gurdy is a marvellous thing: a thrumming, resonating, buzzing box of sound, driven by a hand-cranked wooden wheel and a fistful of keys. It can sound brisk and cheerful or hauntingly plaintive; it can be driven hard to get a really raw attack to the notes, or eased back for a smoother and subtler effect. It’s complex and organic and wonderfully evocative. It works by rubbing a rosined wooden wheel against violin-style strings, which include both fixed-pitch drones and playable melody strings, which are often tuned an octave apart. The drones can also sometimes be tuned (for example, to a perfect fifth) to add an open chordal accompaniment to the melody. 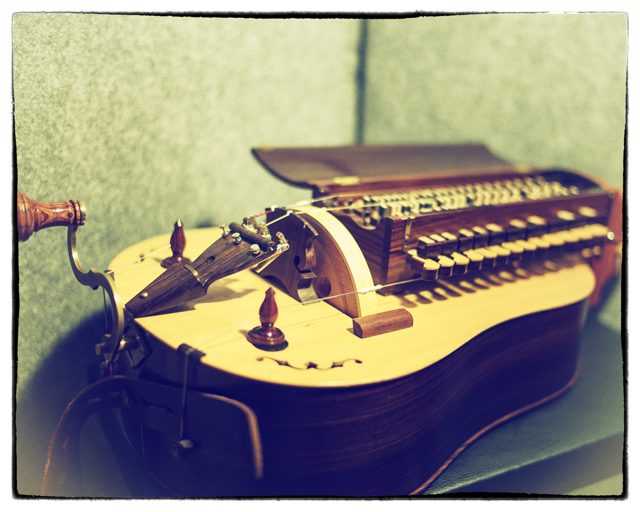 A real-life hurdy-gurdy is a monophonic instrument – one note at a time, apart from the drones – but with ours you can choose to follow tradition or break with it and play chords if you like. On the Effects pane there’s a very nice Reverb to give your sound a bit of breathing space, plus Chorus, Echo, Rotary Speaker and Amp Cab simulations in case you want to put your hurdy-gurdy through the equivalent of a guitarist’s pedalboard. Not very authentic, but good fun! Hurdy-gurdies are notoriously fickle and wayward instruments. They simply don’t do pristine and precise. In fact, hurdy-gurdy players say that to play the hurdy-gurdy, you must spend two hours tuning it; and then one hour playing it… out of tune. 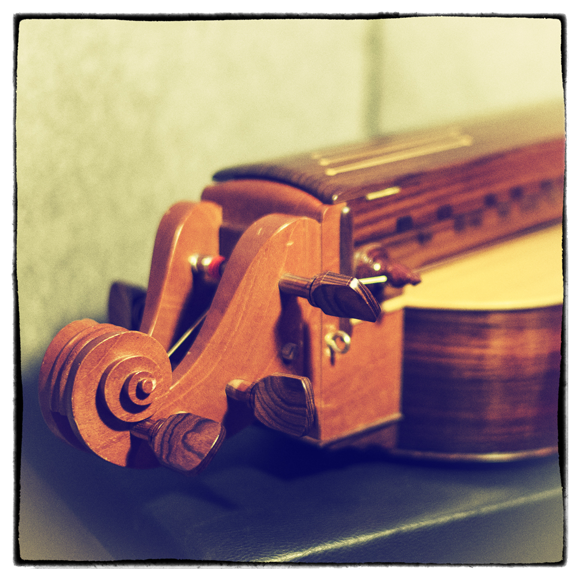 Our Hurdy Gurdy is no different: we’ve made barely any attempt to disguise the excitingly uneven and erratic nature of the sound (okay, we tweaked the worst out-of-tune offenders, but generally what you get is the real deal, warts and all). The hand-cranked strings introduce periodic variations of tone colour and amplitude, and you can add your own, more deliberate, variation by using the mod wheel on your keyboard to control Hurdy Gurdy’s volume. This is a very intuitive way of making the instrument pulse and breathe just like a real player would, and after a bit of practice it becomes second nature to ‘ride’ the mod wheel rhythmically to simulate the turning of the handle. The end result is a triumph of crusty, uneven, tremulous, erratic beauty. This is an instrument with hundreds of years of heritage behind it: a folk musician’s magical box of sounds. Now it can bring its gypsy magic into your mix. If you need a hurdy gurdy, there’s no contest out there. This is it. The real deal. Warts and all. Not so easy to use, but if you spend time on it, it works to your liking. It is very good for BGM of the game. In this genre, this low price is very attractive!! Exactly what I was looking for and at a great price to boot! Organic and rickety, yet hauntingly beautiful. Hoping Rhythmic Robot do more acoustic instrument sampling of weird and out of the ordinary instruments. When I bought this I wasn’t expecting much for the cost. I figured if it got me on the map so far as sound reproduction, for the price, it would be ok. I was surprised at the quality I was able to create after loading the software. I’ll start there. I have many vi’s and plug ins. Not all have loaded easily. I don’t like spending hours to get a vi or plug in loaded, I should be recording instead. I use Kontact 5 full version and Komplete 11. I met all the system requirements to use the Hurdy Gurdy so I bought it. It was one of the easiest loadings I’ve purchased. I have so many to compare to. The default sound was a little unusual. I tweeked the controls that are located on the instrument panel and was able to customize the sound to my ear. The effects that come with Hurdy Gurdy make it sound even better. There’s a decent quality reverb, chorus, delay…..you get a lot for your money by far, in comparison to other companies I’ve done business with. I’m There are also two sound files that are below the Hurdy Gurdy vi icon in the Kontact 5 list where the Hurdy Gurdy file is located. I was also able to open those and have two other different sounding instruments. When I held ‘C’ as my constant string, I was able to play individual notes in the next octave and it sounded just like bagpipes. I sent an email to the ‘contact us’ link. I found it pretty impressive for the cost. I bought Snaps and Claps, useful for their obvious reasons, and one other for a special project I’m doing, With the points given me on my purchase of Hurdy Gurdy, I received seven dollars off the other two items. They were only nine dollars together so after the discount, they cost me two dollars and some change. I can see me doing business with this company again. I do not work for them, I know no one who does. I found them on the internet while looking for a Hurdy Gurdy vi, never heard of them, read good customer reviews and gave them a try. I’m glad I did. Good Luck to All! This is a really great hurdy gurdy! I was looking for exactly this and it delivers. A fun to play and very authentic (to my ear, anyhoo) instrument. I thank Rhythmic Robot for creating this instrument! Sounds quite realistic and otherworldly, with mechanic noises that bring its bit of realism but also many included effects allowing for a certain level of creativity. An original and interesting alternative to other, more common instruments. If you want a Hurdy Gurdy sample library there aren’t many options. This will give you that. But in true RR style it will also give you strange and unique textures. This one is one of my fave Robot libraries. Not only is it one of the best and most flexible libraries of this type, it is also one of the cheapest. I had no idea this was even an instrument! After playing “The Witcher” games since 2007 and more recently having my life consumed with The Witcher 3, I have come to adore the Polish influenced fusion music. I can INSTANTLY tell this instrument was used in it and I have heard it elsewhere before. I absolutely had to pick this up as this plug-in sounds extremely well made and probably as authentic as you can get without traveling to Slav-land :P. The options are simple to use and all make sense without being overly complex. Holding an octive below the melody you are playing on the root key of your song makes for an instantly indistinct sound that is very unique and quite cool! I can’t wait to start using this in electronic fusion music as I think it adds a very cool flavor. I believe The Prodigy have used it or similar samples in their tracks as well. Bravo, Robo. The best Hurdy Gurdy I have found, aside from a real one you can find in Budapest. Great for Eastern European folk, and for lovers of Malicorne. Perfect for processing in Guitar Rig 5. More ethnic instruments, please! Yes, this is a great rendition of a hurdy gurdy. I’ve spent three times the amount for a lesser product. The squeaks and thunks are adjustable too. And as much as it sits well in a folky song mix, you can sneak it into funk, blues, whatever you heart desires. You could say that about all of RR’s products; all of their products can give you a little wheeze, hum, burbles, sparks, or whatever you need to make yourself realistic tracks. Many years ago I’d spend Saturday afternoons in music stores testing out the buzzy little presets and be amazed at the different sounds coming out of box. If you’re sentimental about old keyboards, listen to the demos for their instruments. If you want to go to new places with your sounds, do likewise. 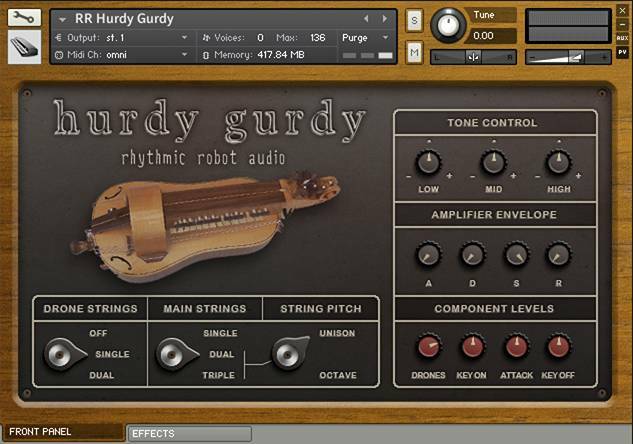 Hurdy Gurdy is possibly my favorite Rhythmic Robot instrument (though there are several other strong RR contenders), and definitely my favorite Hurdy Gurdy virtual instrument. Ears tired of pristine and quantized 21st-century digitalia? Then crank up that hurdy gurdy gathering cobwebs in Great Aunt Mabel’s attic. Found it was flogged in the fifties for a few farthings? Fear not, for this Kontakt-compatible cranky contraption comes to the rescue, “warts and all”. Actually, like Great Aunt Mabel it has no warts but a wheezy cough and chronic arthritis, so it’s perfect for emulating a medieval troubadour or Andy Irvine in ‘As I Roved Out’ [https://www.youtube.com/watch?v=l06ozEXOSaY]. This contrivance has features that no hardware hurdy gurdy ever offered its cranker: (1) double the drone strings and double or even triple the main strings to make it meatier; (2) alter the volume balance between the drone strings, the main strings, the screeching attack of the main strings being pressed onto the friction wheel and the woody rattling of the keys (which is either wonderful or annoying, depending on your mental state); (3) adjust EQ and ADSR; (4) add chorus, reverb, delay and/or rotary FX; (5) output through selectable classic cabinet emulations. A steal at 16 quid, this is a worthwhile addition to any neo-folkie’s cabinet of curiosities. But it falls short of 5 stars for two reasons: the bare sound is a wee bit thin, and some notes are nastily out of tune (though Clever Trevors can tweak ’em into tune in Kontakt). Nonetheless, it sounds great with (low) Irish whistle, and thickened with some chorus and reverb it can even sound like bagpipes.